This year our journey took us from Guangzhou, to Guilin, to Sichuan Province, then finished in Hong Kong. 20-30 September, and 1-2 October 2017. We began by studying the Feng Shui of our meeting-place at Guangzhou International Airport and discovered that they have a very interesting Feng Shui cure in place to ward off the sha qi generated by the Airport Control Tower directly at their front door. 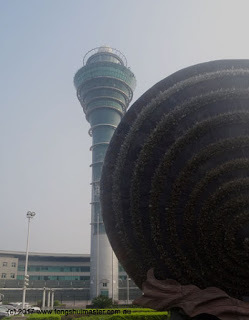 The shape of the control tower is wood, so the Feng Shui master has recommended a huge round disc, made of clay (or ceramic), embedded with thousands of quartz crystals. To most people, this just looks like a creative sculpture at the front entrance, but to the trained Feng Shui eye, it is much more than that. On the first morning of our tour we departed early to conduct a consultation with a client. ‘Tasty Hygge’ is a fashionable floristry business in the huge growth area of Pazhou district, Guangzhou. This island area has grown from small farming villages to a huge metropolis, especially in the past ten years. 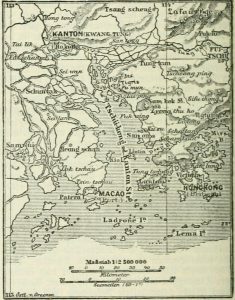 showing the locations of Macao and Hong Kong. As the ships sailed up the trecherous Pearl River (it was not dredged in the early days), they were greeted by a series of pagodas to the left (port) side. Reaching Pazhou Island, due to the geography of the region they were not able to go further and set anchor there. 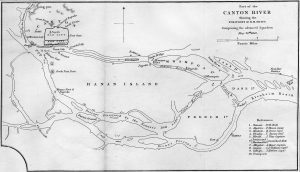 You can see on the map above that the river is flowing from the NW (top left) and makes a turn, splitting and flowing around the islands and then coming together again to the east (right) and flowing down from there towards the sea. 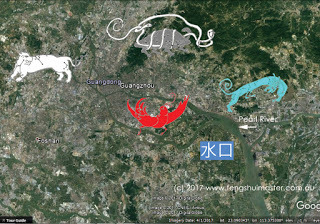 Zhuque (red phoenix) occupies the islands, opposite is Xuanwu (black tortoise) to the north, occupying outlying mountains, Qinglong (green dragon) is to the right and Baihu (white tiger) is to the left. In Feng Shui Zhuque should be a yang area, as it is here in this case, especially with the river running across the south of Guangzhou. Where the waters meet and become wider, that is called the ‘shuikou’ (水口 ‘water mouth’), where the qi accumulates and because in this case, the waters converge and then instead of running straight away too quickly, the water turns a corner; so the qi is able to be captured or retained. In Feng Shui, water is equivalent to wealth. To this day, this island is still one of the most important locations for trading with the rest of the world, because on it, stands the site of the massive exhibition space, Canton Fair, the world’s biggest exhibition centre, which brings products from all over China to be displayed and sold to the rest of the world. So you can see how Feng Shui can explain the strategic advantage of this location, and, looking back in history, we can see that for 500 years this island has remained the main trading post between China and the West. I’m already planning my Feng Shui Tour of China 2018 (October). If you’d like to attend, drop me a line.